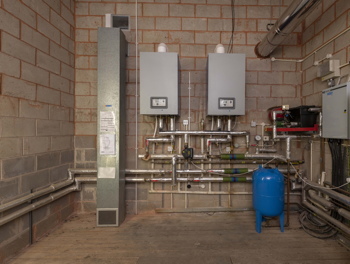 Over the course of two years, Danny Bulch, director at Cedar Green Projects, replaced the boilers, gas fired water heaters and calorifiers in the Welcombe hotel, spa and golf club with new equipment. The main challenges of the project were carrying out refurbishment during peak heat requirements in winter; overcoming access issues to the plant room; and accommodating different fuel options. Five large cast iron boilers with a combined output of approximately 500kW supplied heating and hot water to the spa. As the sections of the boilers kept splitting and were becoming unreliable, a replacement was needed. Bulch selected three Hamworthy Purewell VariHeat cast iron floor standing condensing boilers with a combined output of 540kW to substitute the five old boilers. To accommodate the hot water requirements, PS200 and PS500 Powerstock calorifiers were also specified. These glass-lined indirectly heated water heaters provide a combined hot water output of up to 2,149 l/hour at 50oC differential temperature. They also benefit from a recovery time of only 20 and 18 minutes respectively. In the main hotel building, two large atmospheric boilers on a fan dilution system delivered heating and hot water. One of the boilers suffered from a split heat exchanger which meant the second boiler was the only one working. Bulch opted for Hamworthy’s Wessex ModuMax mk3 196/588V, a small modular condensing boiler with stainless steel heat exchanger that has a 10-year warranty, to replace the old boilers. When atmospheric boilers are replaced with condensing models, changes to the flues are required to deal with the acidic condensate. In this case, a FuranFlex flue liner was applied to the inside of the old chimney which was running through a brick stack to the boiler room. New twin wall flue components were then used to connect back to the new boiler from the liner. Working with Cedar Green Projects, Midtherm Engineering were employed to design, supply and install a new flue system and boiler room air supply and extract system at the historic hotel in Warwickshire. The whole installation was subsequently tested and commissioned by Hamworthy. The hotel’s clubhouse with function rooms and sports bar was the last part of the refurbishment project at the Welcombe. The old boilers were installed in a loft space plant room with awkward access. The chosen new boilers were two Stratton mk2 S2-70 stainless steel wall hung condensing boilers with 5-year warranty and 154kW total output. Additionally, the two boilers have a combined turndown ratio of 10 to 1 for flexible load matching from as little as 15.4kW up to its full output of 154kW. The hotel boilers are now all Hamworthy models across the board, simplifying aftercare. With the installation of the new energy-efficient equipment, the Welcombe Hotel benefits from reliability and standardisation. The installation of multiple boilers ensures a backup is available should a boiler need servicing or maintenance. Additionally, the combined turndown ratio of several boilers also lowers operational costs due to fuel savings, helping the Hallmark Hotel Group with their constant progression within the Green Tourism Sector. 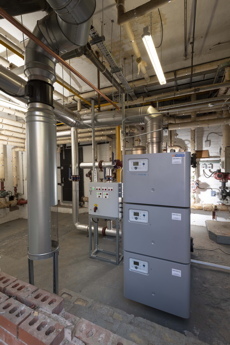 This hotel, like a number of other Hallmark hotels, has benefited from investment in energy-efficient boilers and associated mechanical plant together with a continued room refurbishment programme to improve guest experiences.